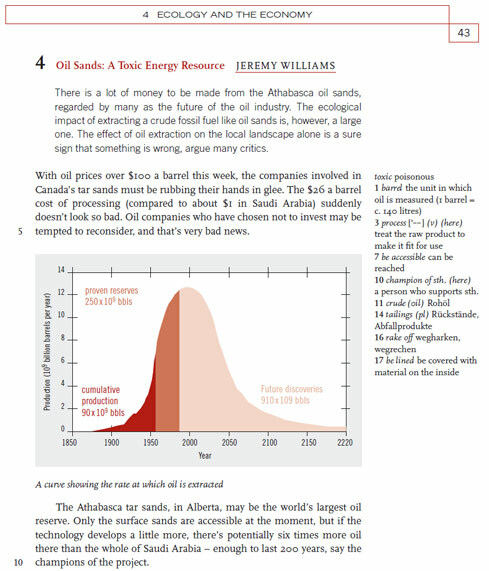 An article of mine on Canada’s tar sands, used in a conversational English textbook for German high-schoolers. It’s in a book called Canada – Dreams and Realities, part of the Schwerpunktthema Abitur Englisch series. Suggestions for using the article include an activity where the class are divided into representatives of either the oil industry, the Canadian government or the Canadian First Nations, for a mock debate.